Today Weather is colder than usual, but that’s okay with me. We know very well that the internet offers us some limitless opportunities for taking our local business to the next level in the Ecommerce industry. It is estimated that most business which have embraced E-Commerce correctly have got an increase in sales exponentially. The big question is, which is this correct way? Unfortunately many might think its just by having a website. Having a websites that do not give sales or provide leads is as good as not having one. A website only will give you only 10% of the traffic you need to convert into sales. Various avenues have therefore been exploited on how to get the remaining 90% like use of Multimedia such us images, Videos, blogs, Squidoo lenses, and many other WEB 2.0 properties that form the bookmaking cloud. Today, we are going to take a rather different approach and start a series of training on how we can establish our presence of our small or Middleclass business online. We are starting with HOW TO GET A 1ST PAGE GOOGLE LISTING FOR A LOCAL BUSINESS. Our main objective here is that when a person types something that is relevant to your business, your website is the first one to appear. I have decided to use hotels as an example for that matter and I hope you will follow the easy steps and enjoy. Google Maps is a great service, right up there with its competitors at Yahoo!®, MapQuest® and others. However, one extra interesting twist that’s going on at Google is that you can include your business address & information that gets integrated into the Google Maps search results via a tab near the top of the page. 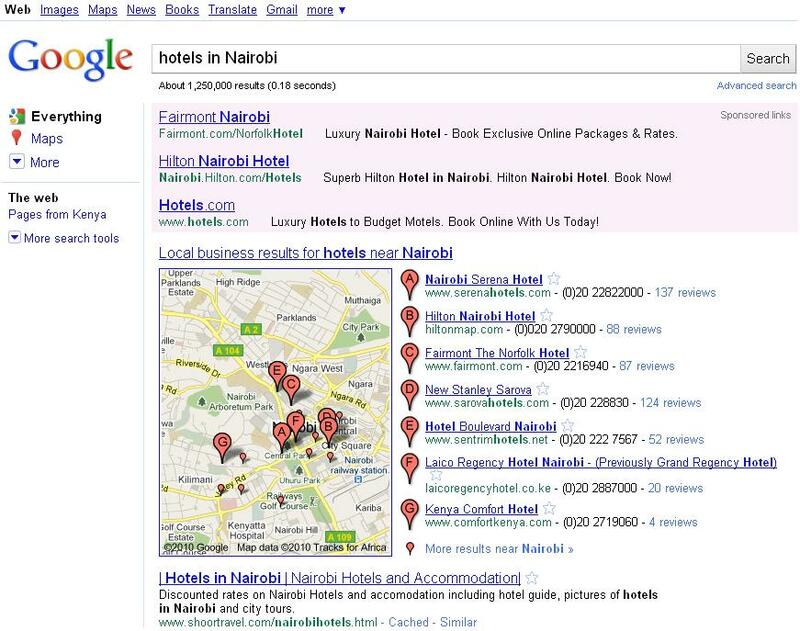 By typing on Google hotels in Nairobi, this is the search result that is displayed. Do you notice the 7 results of local business? Our objective now is getting “Our hotel” Listed in the Results after a person searches for hotels in Nairobi.We are now going to look at the goole maps now. Now before you begin you’ll need a Google Account. You’ll see this on the left side of the page. Before setting this up, if you are doing this for a client, it’s a good idea to use hotel@gmail.com that you can hand over to them upon delivery of your service. If you’re doing it for yourself, well then…use your own Google or Gmail account to sign in. Lets catch up some other time and expound on this topic on how we will list it and find out the Do’s and Don’ts when Listing a business. In case you have any questions regarding this dont be hesitant to ask it in the comments section. You also want to share this for your friends to get some knowledge also. Go ahead.Have a good day.